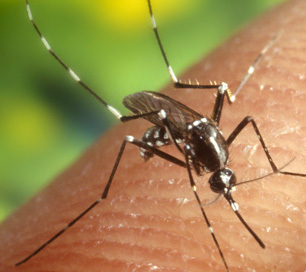 Diflubenzuron is used to control disease-carrying mosquitos. Diflubenzuron is an insecticide used to hinder the growth of flies and mosquitoes that can carry diseases like West Nile Virus. It's used on citrus, soy and cotton crops, ornamentals, forests, pastures, cattle, and on standing water and sewage systems. Human exposure to diflubenzuron is expected to be low due to its immobility in the environment, but exposure may occur in instances where it is applied directly to water storage containers. According to the EPA, diflubenzuron may be treated with activated carbon.